Cozy Home in Historicdistrict- Great Availability! Unique, quite location on culdesac in historic district. Close to Main St. and super convenient to shuttle. This will be your home away from home...walk around barefoot on the heated floors and enjoy the cozy crackle of a real wood-burning fireplace. Room to move on three floors with a full bath on each floor. Top floor with Master (king bed) and 2nd Bedroom (queen bed and daybed with trundle). Both have mountain/slope views. Main floor has alcove with queen sleeper sofa, living room with fireplace and fully appointed kitchen/dining area. Basement has spacious family room with big screen HD TV, queen sleeper sofa, bunk bedroom and luxurious bathroom. Our family is so fortunate to live in Denver and have our home away from home in Breckenridge. We have three young skiiers that get better by the day and we are having the time of our lives watching them grow and learn. Skiing is our favorite family activity...we just can't get enough. Breck is a great town...not just an amenity to a ski area. Lots of character, history and most of all fun! Enjoy being in a house that's part of a friendly neighborhood and close to all the things you want to do, both daytime and nightlife. Overlooking Breckenridge ski area and mountains all around. Bar height dinning table with seating for 8. Air Hockey in the basement. I could NOT have been happier with my stay at this home. It was just as described, and more. 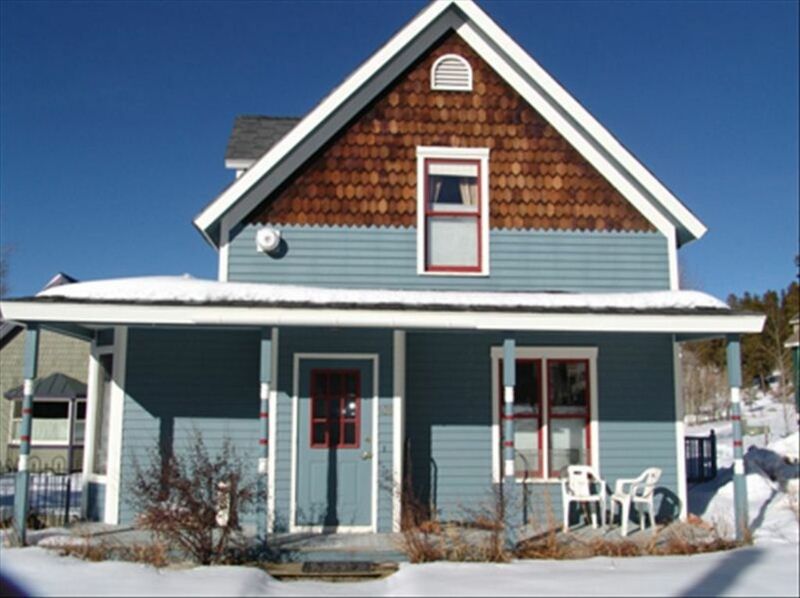 The location to downtown Breck is awesome and the house itself is so comfortable, fully stocked with what you might expect, and the owners were beyond responsive and personable. I literally had zero issues which is a first for me with experiences such as this. I injured myself while skiing on my first day, so I had much more "time at the house" than I had anticipated given I was unable to ski again during my trips. So....I think I've got a very good feel for the house and what it offers! :) If/when I come back to Breck, this will be the first place I check for availability. Book this property if you're coming to Breck...you will NOT be disappointed! We loved our first trip to Breckenridge and the house made it extra special. It is cozy and well-located. Easy access on foot to trails, parks, and Main Street. And the owner was very friendly and responsive. Nice property with a nice location in a nice little town! We had a group of 7 and we still had plenty of room. Great location, can walk to shops and restaurants. Cant wait to come back next year! We couldn't have been more pleased with the Harris Alley house - it had plenty of room for our family of five, with lots of space to spare. It could have easily slept a whole other family with small children due to the extra beds and pull out couches available, and plenty of bathrooms. The shared courtyard in the back is beautifully landscaped and had room for the kids to run around. The proximity to Main Street and all the restaurants off Ridge and French was excellent, and it's walking distance to the gondola/Peak 8 and a great kid-friendly hike at the base of the Snowflake Lift. The hosts were extremely accommodating and very quick to answer questions we had about amenities, check in, etc. We will definitely want to stay at this house again next time we visit Breck.